Google Pushing Business Owners in Places To Use AdWords Via "Boost"
Home > Google News > Google AdWords > Google Pushing Business Owners in Places To Use AdWords Via "Boost"
It is no wonder Google pulled the website URL tag option from Google Places. 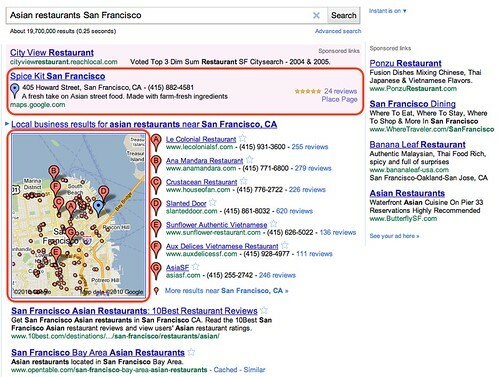 The same day Google announced the launch of a new ad promotion named Google Boost. Today, we’re announcing the availability of a new online advertising solution to help local businesses connect with potential customers in their area. 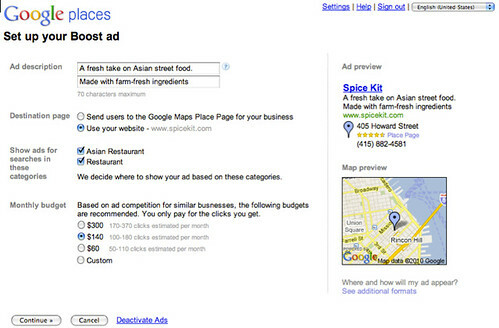 Boost enables business owners to easily create online search ads from directly within their Google Places account. No ongoing management is needed after the initial set up, and this beta is currently available to select local businesses in San Francisco, Houston and Chicago. Boost ads are eligible to appear in the “Sponsored Links” section of Google.com and Google Maps search result pages. Greg Sterling has some more information at Search Engine Land but keep in mind, it is only currently available for businesses in San Francisco, Houston and Chicago. To be notified when Boost comes to a city near you, fill out this form.